The K9 Storm 20/20 Vest is the first high performance guide dog vest on the market. Custom-fit to each dogs specific measurements, the 20/20 Vest is comfortable enough to be worn all day. Advanced fiber technologies, proprietary hardware, and exclusive assembly techniques come together to create the lightest guide dog system ever. The total weight of the K9 Storm 20/20 Vest is an incredible 1 lbs. This includes the 4 way fully adjustable and removable carbon fiber handle. Your guide dog is your lifeline. They are your mode of transportation and are critical to your everyday wellbeing. Because of this, the stylings of the 20/20 Vest are modeled after high performance race cars. With a beautifully sleek design and vibrant colors, bystanders will not only notice you, but do a double take. 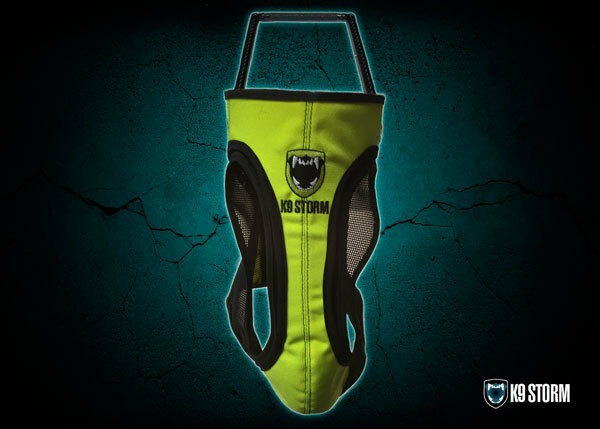 Our patented K9 Storm Vest design fits your dog like a second skin, allowing energy transfer to run directly up the handle and into your hand. Feel the power and experience the difference. For more info, contact sales@k9storm.com. The 20/20 Vest will be officially available for purchase on October 1st, 2017.